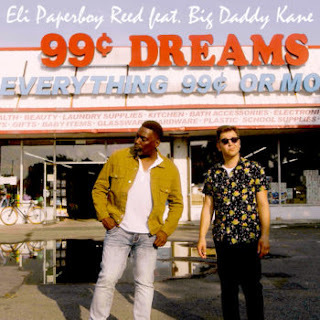 If It's Too Loud...: Eli Paperboy Reed featuring Big Daddy Kane - "99 Cent Dreams"
Eli Paperboy Reed featuring Big Daddy Kane - "99 Cent Dreams"
In one of the oddest (and most perfect) pairings of the year, the newest single from Eli Paperboy Reed features a verse by Big Daddy Kane. How did this pairing happen? Big Daddy Kane named Reed as one of his top 10 favorite current singers on Instagram, and the two struck up a friendship. Their song together, "99 Cent Dreams," is one of the purest throwbacks I've heard in years. The song is pure Eli Paperboy Reed throwback classic soul, as you'd expect. It calls back to the days of your youth when you'd desperately try to scrounge up 99 cents to buy something from the store, and at that point in your life it's all you really needed. Despite it being a classic sounding soul song, once Kane's verse kicks you'll start daydreaming of the days of the late 80's/early 90's when every song needed to have a rap verse in the middle. This is pure nostalgia in every great possible way. You can watch the video for "99 Cent Dreams" (which is also packed full of nostalgia) below. You can purchase your copy here. For more on Eli Paperboy Reed, check out his website. For Big Daddy Kane, check out his website.